Madison Sittig is from Iota, Louisiana. She is currently a senior at Iota High School, where she serves as president of the FFA chapter. She is involved in the Beta Club, Student Council, and is also a member of the Lady Bulldog Track Team. Throughout her high school FFA career, Madison has been a very involved member of her chapter. Madison is no stranger to the show ring. She has shown livestock for the past nine years. Furthermore, she has also competed in various Career and Leadership Development Events such as Creed Speaking, Extemporaneous Speaking, Milk Quality and Products, and Livestock Judging. Her proudest accomplishment is that she was a part of the Livestock Judging team that placed second at the state CDE this past April. She served as secretary of her FFA chapter for three years and also had the opportunity to serve as reporter for the Area III Federation this past year. Upon graduation, she hopes to attend McNeese State University to double major in early childhood development and business so one day she can open her own daycare. 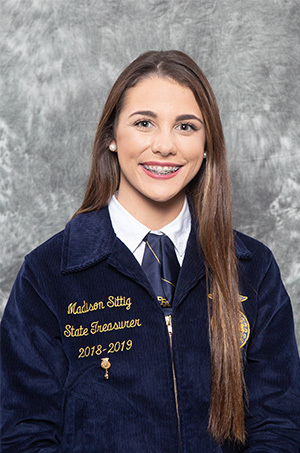 Madison Sittig is proud to serve as our 2018-2019 State FFA Treasurer.